Find hotel near Ratnagiri Buddhist Excava .. The Ratnagiri Buddhist Excavations include the ruins of the Buddhist caves and monasteries of Kalinga, or the present day Orissa. These were built in the early 6th and 7th centuries, and only the gateways and some walls remain in this site. In spite of this, the place is a tourist attraction, with a lovely view of some surrounding ruins. 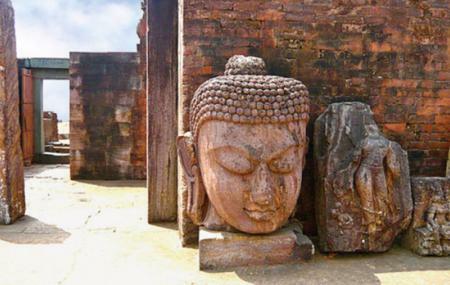 You should visit this historically rich place at least once on your trip to Bhubaneswar. Avoid visiting the site on Friday as the museum will be closed on that day. The excavation site is open for 24 hours. How popular is Ratnagiri Buddhist Excavations? People normally also visit Odisha State Museum while planning their trip to Ratnagiri Buddhist Excavations. Really a nice monument but it have to maintain properly so that tourist can enjoy their time very well. The more attractive thing is Lord Budha sitting position. It should be decorate with proper light. New & Modern decoration system required. Authority should take more responsive action in coming days. The surrounding garden is very well. One of the best Buddhist monument place of not only of odisha but also of India. It has a wide range of natural beauty. Nice place to picnic specially in November to march. Museum of this monastery is so beautiful. This is a good place to know about Buddhist culture..
Has good views plus it's a good drive.